This is my animation created from 12 captures over 97 minutes of the 100,000 km tall solar prominence yesterday. 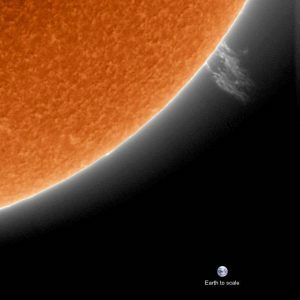 PK Imaging called this “My single best image of the prominence.” Notice the size of Earth in the lower right! PK Imaging posted this image and animation of a solar prominence – caught on January 2, 2019 – at EarthSky Facebook. A solar prominence (also known as a filament when viewed against the solar disk) is a large, bright feature extending outward from the sun’s surface. Prominences are anchored to the sun’s surface in the photosphere [sun’s visible surface], and extend outwards into the sun’s hot outer atmosphere, called the corona. A prominence forms over timescales of about a day, and stable prominences may persist in the corona for several months, looping hundreds of thousands of miles into space. Scientists are still researching how and why prominences are formed.